It is the only all-season ski and summer resort in the country owned by a city--Denver--just 67 miles down the road. It is served on winter weekends by a scenic ski train from Denver, which deposits skiers just steps from the main base area chairlifts. One section of the resort is named for a locally famous lady of the evening, Mary Jane. And, in addition to being one of the oldest ski resorts in the U.S., it is the oldest continually operated ski area in Colorado, a state known for the abundance of its snowfall, views, and terrain. When it opened in 1939, skiing was still pretty much an exotic sport with limited appeal. Today, Colorado attracts more skiers, snowboarders, and cross-country enthusiasts than any other state, and Winter Park is one of its most popular destinations for snow sports enthusiasts. From a single rope-tow with a couple of trails, the resort is now spread out over nearly 3,000 acres across three mountains and an alpine bowl. It is served by 22 chairlifts to access 134 trails and all its powder stashes, mogul fields, and hidden glades. Historically, Winter Park Resort has been more popular with "locals" than with long-distance visitors, but that is changing as its reputation grows--along with the convenient and well-designed complex of condos, hotel rooms, restaurants, and shops at the main base area. The signature ambiance of Winter Park--winter, spring, summer, or fall--is more laid back, friendly, and unpretentious than its neighbor resorts. Many Denverites are day-trippers, and many of them arrive by the Ski Train, which departs Denver's Union Station each Saturday and Sunday morning in time to deliver skiers to the slopes by 9:30 a.m., departing again when the lifts close, at 4:15. The train emerges from the tunnel just yards from the main lifts with an ear-splitting whistle and a blast of steam that fills the sky for a few moments, then evaporates into the crisp cold air. The Ski Train also operates on Saturdays during the summer, delivering hikers, bikers, and visitors to Winter Park's many festivals. Strategically located next to the Continental Divide, Winter Park has the distinct advantage of being able to catch winter storms from nearly every direction. Western and southern storms get trapped by the Divide and can't move until they've made a significant deposit of snow onto the slopes. 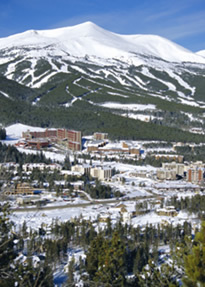 On average, Winter Park receives 369 inches of snow annually, more than other major Colorado resort. The rest of the year, the same weather patterns provide bright, clear days cooled by mountain breezes and a nighttime sky dotted with twinkling stars. Winter Park is a very family-oriented destination, and its ski/snowboard school is consistently rated as one of the best for teaching children and adult beginners. This is the perfect place to try a day on skis, with affordable learn-to-ski programs as short as one day. Even for non-skiers, this destination offers unlimited opportunities for winter fun. If you can walk, you can snowshoe, and there are daily guided tours providing a history of the area and lots of photo opportunities. Or opt to take a similar tour in a snowcat or snowmobile. And, if you've ever wanted to hear "mush, you huskies" in person, take a dogsled ride. With good eyes and good luck, you might spot porcupine or bighorn sheep along the trails. Winter Park also is home to the National Sports Center for the Disabled, an internationally-acclaimed facility that teaches some 3,000 participants a year to enjoy winter and summer sports activities, from skiing to horseback riding. When the snow melts, Winter Park and the Fraser Valley burst into bloom with a blanket of multi-colored wild-flowers--dark red Indian paintbrush, ethereal wild roses, and feathery purple larkspur. Winter Park is situated in the Arapahoe National Forest, and there are more than 200 miles of hiking trails and 600 miles of mountain biking trails in the area. Hikes range from easy jaunts through open fields to challenging efforts on steep mountainsides--the prize is a picturesque and private waterfall ideal for a picnic lunch. Let Winter Park's Zephyr Express chairlift take you and your bike to the top of the mountain and choose among 45 miles of trails back to the bottom--the same trails used by skiers in winter. Fishing is available too--for hard-fighting cutthroat and rainbow trout and the hulking mackinaw. And golf--this is the place to improve your drive, since at 8,000 feet, it goes 15 percent farther than at sea level--as long as you don't get distracted by the views from the fairway of lush, green mountains. And for the kids (grown-ups are allowed, too), an alpine slide zooms down 26 linked turns on two parallel tracks. If you have strong fingers and a strong will, try the year-round indoor climbing wall at the West Portal Station at the Winter Park base. Safety ropes protect you from falling, and there are three routes to the top, 30 feet up, that vary from relatively easy to "this is impossible." Climbers usually draw a supportive audience, which cheers the loudest when a youngster makes it to the top. There are family events all spring and summer: the Hike & Bike Festival in June; the High Country Stampede Rodeo, American Music Festival, and Winter Park Jazz Festival in July; Arts in the Park and the Famous Flamethrowers High Altitude Chili Cookoff in August. The music festivals draw top-name performers, such as Bonnie Raitt, Winton Marsalis, and Hootie and the Blowfish. The town of Winter Park is a few miles down the road. It's a funky, old-fashioned Western town with a few trendy new art galleries and several shops that offer made-in-Colorado products. Local buffalo jerky is a great gift--for yourself, too. Owner/Operator: City and County of Denver, Colorado. Location: 67 miles northwest of Denver, in the Vasquez Mountains of the Arapaho National Forest. Base area is 9,000 feet; summit 12,060 feet at Summit Cone on Mary Jane Mountain. Accommodations: More than 100 condominiums, ranging from one- to six-bedroom units, family-style mountain inns (serving breakfast and dinner daily), hotels, bed and breakfasts, lodges, and motels. Transportation: Free shuttle bus service among most lodging properties and activities in the Winter Park resort base area and the Fraser Valley. Another free shuttle serves local restaurants on weekend evenings. Contact: Winter Park Central Reservations, P.O. Box 36, Winter Park, CO. 80482; (800) 729-5813; www.skiwinterpark.com. WPCR also can book air and rail tickets, rental cars, and airport transfers.